How Do I Create Bookmarks in a PDF? – How can we help? Slicing PDFs require bookmarks to be activated. 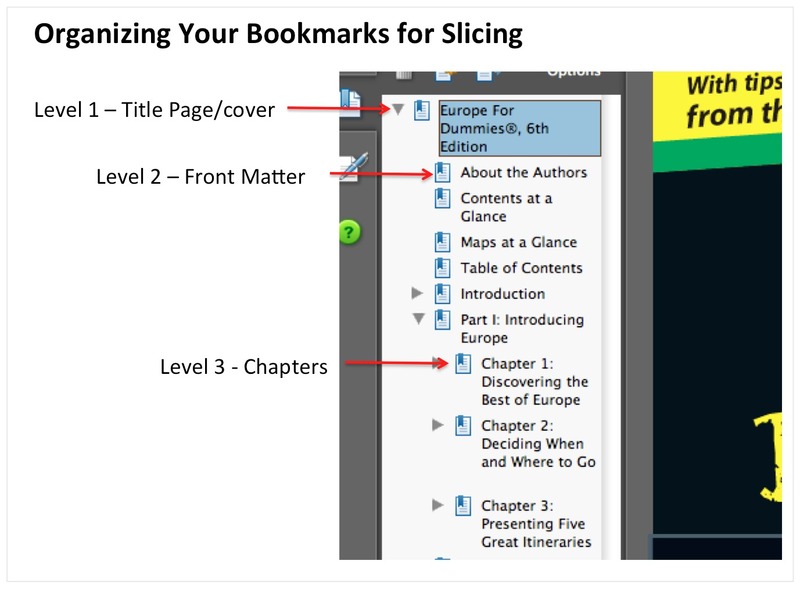 Here is how to view, enter and organize your PDF Bookmarks for optimized slicing. Bookmarks appear on the left side of a PDF document. To view Bookmarks (this may differ depending on your version of Acrobat) from the menu bar choose “View/Navigation Panels/Bookmarks”. To create a bookmark, first view the page you'd like to bookmark. For example, if your document has a Table of Contents page, navigate to that page. 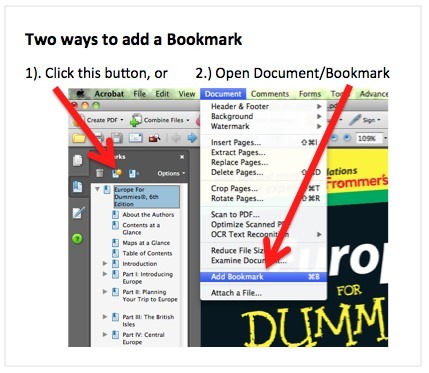 Depending on your version of Acrobat, there can be two ways to add a Bookmark. You can either click on the button located at the top of the Bookmark menu (see image below) or open Document from the Menu and choose “Add Bookmark”. To organize your Bookmarks by levels (Level 1, Level 2, etc.) drag one or more bookmarks directly under a higher-level Bookmark. For example, if your book has both Sections and Chapters, typically you would drag the Chapter Bookmarks directly under the Section to make the Sections a higher level.